After eating school food for the last three weeks, I was so excited to go home. My main goal was to go to the local fair to eat pizza, deep fried oreos, and orange juice. This mission was a success. However, Saturday and Sunday were both full of delicious meals. My favorite? OMELETS. It might not be that complex to make an omelet, I’ll include the ingredients and quantities for the omelets I made, feel free to use different quantities at any point or substitute in other ingredients. There is really no way to mess up an omelet. But, as a warning, I’d like to state now that I take my omelets very seriously. 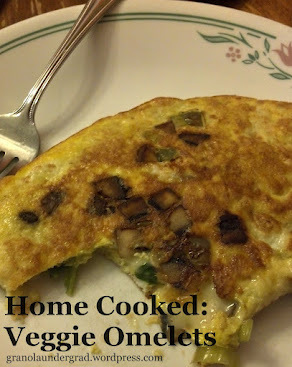 The first step to the perfect veggie omelet is to cook the veggies. I start by chopping up my ‘shrooms and peppers into little cubes so that they spread and cook better. Then I put them into my favorite pan with a small chunk of butter. While these veggies are cooking, I crack my eggs and whip them up. There are two ways to get your omelet started. One way is to keep your veggies in the pan and pour your eggs over it. This could lead to crumbling when you try to flip it. I prefer to pour the cooked veggies into a bowl, then pour the whipped eggs into the pan then immediate add the veggies while the egg is still raw. It holds it in and nothing falls apart. Fabulous. Anyway, after the egg and veggies are cooked and the omelet has been flipped, put a layer of either spinach or arugula over the omelet and your hand-shredded cheese on top. Let the greens wilt and the cheese melt then fold it in half and ENJOY! Yum-o. Seriously, after being at school for weeks there’s nothing better than a free-range, hormone-free, organic, locally-grown omelet. And yes, I did eat a giant omelet the size of my head. No regrets. Wikipedia offers an interesting list of different omelet traditions around the world. Jamie Oliver has some tips if you’re a first time omelet maker. Plus I love Jamie Oliver. And here’s the history of egg consumption. Am I the only one who finds this fascinating?